As part of a major marketing revamp and agency overhaul, McDonald's is leaning heavily into digital and plans to double the amount of content it cranks out this year. CMO Deborah Wahl talked about the burger-slinger's revamp this morning during the Interactive Advertising Bureau's IAB Mixx Conference. Specifically, she called out some of the brand's work on Twitter, Snapchat and YouTube as examples of the chain's successful digital work. "In the last two years, we've created approximately 2,500 pieces of marketing content a year," she said. "This year, we will create roughly 5,000 pieces of marketing content, so we're making more content but we're also challenging ourselves to make our content much more valuable to our customers." On Snapchat, McDonald's set up geofilters around all 14,000 of the brand's restaurants with an image of french fries that users could add to their snaps. Wahl said the geofilters have been used 12 million times and generated 308 million views since launching last year. "We approached it as inserting some playfulness into a culture of curated moments," she said. Wahl added that McDonald's is mentioned once every two seconds in the U.S., but the brand only responds to one mention every 10 seconds. 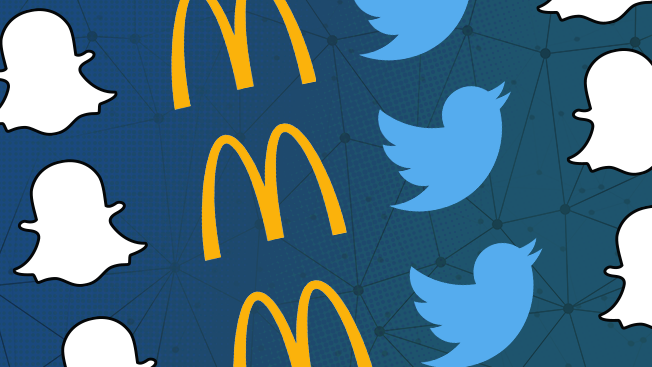 All told, McDonald's has written 143,000 notes to consumers through channels like Twitter, which has back-fired in the past. "That means we have a lot of room to go and do a lot more communication," Wahl said. One way that McDonald's is personalizing orders is through its mobile app, which Wahl said has more than 10 million downloads since launching last year. The app uses push notifications to ping users with deals and coupons based on their data—like where they are and the day of the week. Most recently, McDonald's handed its massive $1 billion creative and media business to Omnicom, which is creating a dedicated unit for the account that will be staffed with employees from DDB, Sparks & Honey, Critical Mass and tech companies like Google and Facebook. The new approach is aimed at building, "the type of agency that could drive the innovation, velocity and impact that we require," Wahl said. "I really think we've tried to define media and marketing very narrowly," she added. "We label the ways we talk to people, but marketing communication is no longer executed via separate vehicles—digital, broadcast, print or mobile. Defining marketing by these channel-based labels is actually absurd in today's world."